A total of 70 points is still being targeted by Harborough Town despite a 3-2 loss at ON Chenecks last time out. Boss Nick Pollard set the mark at the start of the season and believes his team have what it takes to reach it even though it requires picking up another 19 points from their remaining nine games. “It’s six wins and a draw from our last matches which will be tough but we’re still going for it,” Pollard said. “We set that target as it is a 10-point improvement on last year. “The players all have their own targets as well and we’ll work hard over the remainder of the season to hit them. “It was very disappointing at Chenecks because that was a game we’d earmarked as a win – I expected us to pick up three points. The Bees now head to Wisbech this weekend knowing they have to win to have any chance to climbing up the table. Pollard added: “It will not be easy. They’re a few points in front of us and if we have any hope of finishing eighth we need to beat them really. 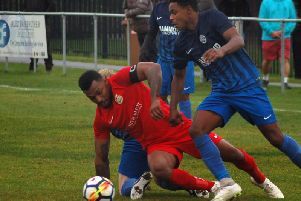 Meanwhile, Pollard also reported Martin Anderson – who has was recently appointed County golf captain – has returned to training and might feature before the end of the season.